The United States Botanic Garden is rooted in the nation's heritage. During the late 18th century, George Washington, Thomas Jefferson and James Madison shared the dream of a national botanic garden and were instrumental in establishing one on the National Mall in 1820. 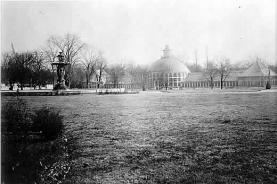 The institution actually traces its beginning to 1816, when the constitution of the Columbian Institute for the Promotion of Arts and Sciences in Washington, D.C., proposed the creation of a botanic garden to collect, grow and distribute plants of this and other countries that might contribute to the welfare of the American people. 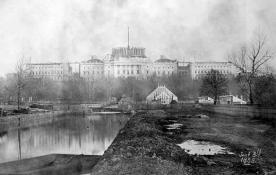 The Institute's garden was established by Congress in 1820 to the west of the Capitol Grounds, from First Street to Third Street between Pennsylvania and Maryland Avenues. This facility functioned until shortly after the organization stopped holding meetings in 1837. In 1842, the idea of a national botanic garden was reestablished when the United States Exploring Expedition to the South Seas (the Wilkes Expedition) brought a collection of living plants from around the globe to Washington, D.C. Initially placed in a specially constructed greenhouse behind the Old Patent Office Building, the plants were moved in late 1850 into a new structure on the site previously occupied by the Columbian Institute's garden. 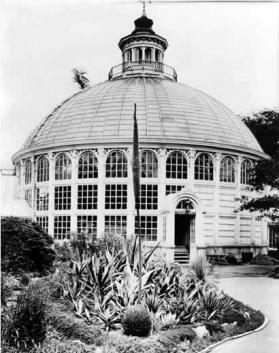 In continuous operation and open to the public since 1850, the Botanic Garden moved to its present location in 1933, a complex located along the north and south sides of Independence Avenue bordered by First Street and Third Streets, SW. The Garden includes the Conservatory, which was renovated from 1997-2001; the National Garden, which opened in 2006; and Bartholdi Park, which was created in 1932. A plant production and support facility opened in Anacostia in 1993, which includes 85,000 square feet under glass divided into 34 greenhouse bays in addition to maintenance shops. The U.S. Botanic Garden was formally placed under the jurisdiction of the Joint Committee on the Library of Congress in 1856 and has been administered through the Architect of the Capitol since 1934. The Architect of the Capitol has served as Acting Director of the U.S. Botanic Garden and is responsible for the maintenance and operation of the Garden and for any construction, changes or improvements made. A Botanic Garden for the Nation: The United States Botanic Garden presents the first comprehensive look at the U.S. Botanic Garden in Washington, D.C., in a beautifully illustrated book. Conceived by the nation's founders as a resource for collecting and studying plants, the U.S. Botanic Garden is closely linked to the history and development of the capital city. Through historical documents and colorful photos, A Botanic Garden for the Nation tells an important story about this special place. Through sumptuous photographs, it offers a tour of the Conservatory through every plant environment from the lush Jungle and colorful Orchid house to the spare World Deserts. The engaging text explores ecosystems and reveals details about interesting plants and plant collections. This book on America's garden is now available for purchase in print from GPO access or for free in electronic form.